This article is part of an occasional series on ‘The Political Aesthetics of Power and Protest,’ the subject of a one-day workshop held at the University of Warwick this September. This article is part of an occasional series on ‘The Political Aesthetics of Power and Protest,’ the subject of a one-day workshop held at the University of Warwick this September. Democracy, since it does not function through command or coercion, requires instead a constant renewal of sets of symbols - symbols which appeal to people and instill in them a sense of belonging and identification. 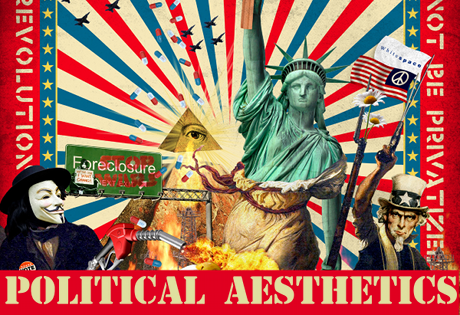 Increasing disenchantment and disillusion with the state, with political institutions, their practices and performance, makes it more important to explore the place of this aestheticisation of political language, the aesthetics of protest as well as of power. In India the moment of independence in 1947 and in South Africa the 1994 ‘transition to democracy’ witnessed new sets of elites taking over existing political institutions. In both cases this involved a material and symbolic process of ‘reclaiming’ old colonial political buildings for the new nation. Here we focus upon two artworks that have been viewed in India and South Africa as important interventions in this process. The Keiskamma Tapestry that hangs in the South African Parliament and the murals that are painted on the wall of the outer corridor of the Indian parliament: both depict in a serialised form historical narratives of the life of the nation. In situ they both explicitly re-tell a narrative of the nation which is at odds with the imperial iconography of the parliamentary buildings themselves. The murals and the tapestry have much in common that speak to the struggles over representation of the nation in postcolonial contexts. They are part of the complex and multi-layered ‘archi-texture’ of the parliamentary buildings, which continue to echo with older articulations of power and nationhood, providing points for ongoing contestation of what the nation is and should be. India became independent in 1947. To be Indian, rather than a subject of empire, or a member of a religion - Hindu, Muslim, Sikh or Christian - had to be transitioned in the wake of the bloodbath that was the Indian partition. The new elites of independent India set about not simply occupying but indigenizing old imperial spaces of governance with new art and artefacts, new accommodations, rules, procedures and norms framing different spectacles of political power and of nation-building that preoccupied the nationalist government and its leaders. ‘Nation-building’ was a project that encompassed both the firming up of hegemonic political and cultural discourses through constitutional and legal arrangements, as well as economic and militarist infrastructures that allowed the knitting together of disparate populations into one stable political entity - the independent nation-state. Some of the struggles for expressing the new nation as it took shape can be read off the murals, portraits and statues that were commissioned for parliament. The first Speaker of the Indian parliament, G V Mavalanker set up a Planning Committee in 1951 and later a sub-Committee to examine the issue of decorating parliament. The Sub-Committee felt that under the British, public buildings were designed and constructed in ‘the Western style, however unsuitable they might be for the country...[and that] art executed by the well known artists and sculptors of India, would ...help [the visitors who viewed these] to purify their thought, advance their knowledge of the glorious past of their country...’. As the new republic took shape, marking it in public spaces was an important mode of translating freedom into material moments for the nation’s citizens – changes to the names of streets, removal of some and installation of other statues and public art, emphasising both familiar public ceremonies and creating and staging new ones – through all this the nation was performed, given authoritative sanction and legitimized. The murals in the outer corridor of the Indian parliament tell the story of ‘India, that is Bharat’ from its inception as an idea to its moment of independence from British rule in 1947. To ‘read’ the story that these murals tell takes about forty five minutes; from gate five we turn right and do a ‘parikrama’ (circumnavigation) invoking the feeling of being in a ‘temple of democracy’ (as Nehru called parliament), of familiar sacred spaces for some and for others, an awe-inspiring distant cultural landscape. As the Report emphasises, the selection of the themes of the murals was carefully made to inspire citizens and representatives by ‘depicting the outstanding episodes in the nation’s history...’; the state wished to make a visual bridge between India’s ancient culture and its emergent identity as a modern new nation; what is retained, excised, transformed and indigenized holds clues about elite imaginaries and aspirations. In 1994 South Africa elected its first democratic government by universal franchise. The new Members of Parliament sat down to govern in the same set of parliamentary buildings that had been used by the apartheid government before them, and the British colonial state before that. Whilst some have suggested that the old buildings were ‘simply taken-over’ by the new leaders, a focus on the artwork in parliament reveals that any process of ‘appropriation’ is an ongoing and contested process. Until 1996 art depicting apartheid-era leaders and symbolism continued to hang in parliament. It was removed following the suggestion of the Ministry of Arts, Culture Science and Technology that ‘Parliament should be a catalyst for change in South Africa’. The old collection was thus replaced in 1996 by a collection of works known as Art Against Apartheid, a collection of over 100 works by 78 international artists that was first shown together in Paris in 1983 in an exhibition sponsored by the United Nations and its Special Committee against Apartheid, UNESCO and the governments of Finland, Sweden and Norway. The old collection (around 4000 pieces) was then catalogued and is now kept in a new purpose-built storage facility. An arts curator appointed in 2001 to care for the old parliamentary art collection and purchase a new one pursued a policy of addressing the absences in the old collection. This amounted to a conscious decision to buy art by black artists or women artists, artworks depicting women and art that used craft techniques as opposed to reflecting European artistic traditions, such as oil painting. As a part of the endeavour to transform the art on display in the South African Parliament, the Keiskamma Tapestry was brought in to hang in Parliament. The Keiskamma Tapestry depicts in 73 panels that stretch to a combined length of 120 meters, scenes from a history of the Eastern Cape region of South Africa. Its inception was somewhat different from the Indian Parliamentary murals. The tapestry was conceived by Carol Hofmeyer, an artist and medical doctor who moved to Hamburg in the Eastern Cape in 2000 and shortly after established an art project, the Keiskamma Trust, with the aim of providing employment for the women of the area. The Keiskamma Tapestry was the project’s first large scale art work. The Tapestry was bought by Standard bank for R500 000 and thereafter loaned to Parliament in 2006. It was unveiled in its current location on 8 March 2006, International Women’s Day by the then Speaker Baleke Mbete in a special ceremony. The tapestry was not made specifically for parliament nor was its creation directed or controlled by parliament in any way. The Keiskamma Tapestry is a work informed by, some have suggested a ‘parody’ of, the Bayeux Tapestry that is also in dialogue with a number of other ‘conquest’ tapestries both local and global. There are several other instances in which the form of the Bayeux Tapestry has been used by other groups as a prototype through which to tell their own stories of invasion and conquest. These other responses to the Bayeux include the 1926 Broderie de Fecamp, the 1968-74 Overlord Embroidery, the 1988-94 Jersey Occupation Tapestry, the 1997 Fishguard Invasion Tapestry and perhaps most relevantly, the 1963 Rhodesian National Tapestry. Brenda Schmahmann has speculated that when devising her project Hofmeyer may have borne in mind the Voortrekker Tapestry which was made to hang in the Voortrekker Monument in 1952-1960. Such echoes draw attention to the difference the Keiskamma Tapestry sought to materialise and convey. Crucially, the Keiskamma Tapestry tells its narrative from the perspective of the defeated. It does so not only through the content of the narrative but the choice of form. Needlework and more specifically embroidery have a long history in Southern Africa. 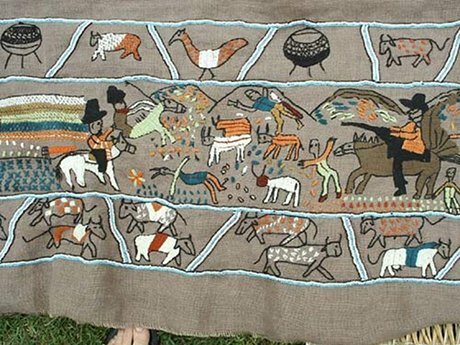 In the Eastern Cape region where the Keiskamma Tapestry was made, needlework, appliqué and beadwork traditions are intertwined with the moment of colonisation which the Tapestry in part depicts. In the eighteenth century imported cotton cloth and glass beads were traded between white settlers and traders and local peoples. Cotton began to replace leather in the clothing and material culture of Eastern Cape dwellers. Needlework was a mainstay of missionary teaching in the area. 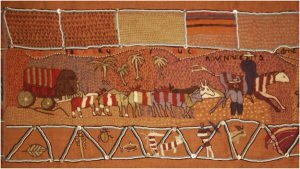 In making the Tapestry the Keiskamma artists used the ‘stem and laid stitching’ seen in the Bayeux Tapestry but combined this with ‘their own repertoire of natural stitching and beading techniques’ that emerged in part from the cultural collisions of colonial conquest. What are the stories that the murals and tapestry tell? The Indian Parliamentary murals depict the idea of ‘India that is Bharat’ through two narratives: one, of forging the nation, though recounting a specific history - invoking myth and/as history; remembering and forgetting historical moments; reshaping its diverse political landscape and re-configuring gender relations as well recovering India’s ‘democratic past’ to secure its place as a modern democratic state. Second, they tell the story of cementing the legitimacy and accountability of the new nation through state building, where two particular facets are invoked - multicultural secularism and India’s international profile. The recovery of the idea of India goes together with the representation of historical evidence of excellence of Indian philosophy and statecraft as well as its tolerance of difference in several murals. Figures of gods and religious leaders from all the significant religions of India[i] are represented in these murals. These reflect the particular form that secularism was to take in India – multicultural and largely non-integrationist. It allows for the state to recognize (through ‘gazetted holidays’ on festivals of all major religions, through depictions in state sponsored art) various religions and to ensure that all are given constitutional parity (through equal access to fundamental rights of Indian citizens). Panel 45, for example depicts the court of Akbar, with his ‘seven jewels’ – musicians, advisers, philosophers from both Hindu and Muslim communities; a medieval ‘government of all the talents’. Not a single mural depicts the oppression of the Indian people – there are no scenes of the massacre of Jalianwala Bagh on 13 April, 1919, for instance, but the murals do depict resistance to the almost absent oppressor through images of heroic leaders of the nationalist struggle. In these murals Indian leaders are agents of their destiny rather than victims of colonial rulers. Mural No. 59 depicts the leaders of the Great Revolt of the 1857, Rani Laxamibai and Tantia Tope, in valorous poses, Panel No.115 shows Gandhi’s Dandi March in 1930 against introduction of tax on salt and Panel No.117 and depicts the hoisting of the national flag at the Red Fort on 15 August, 1947, India’s independence day. Other than the presence of the Dandi Marchers in Mural No. 115, also absent are the Indian people – subaltern faces, bodies and acts are folded into the iconography of heroism of elites, effect and affect celebrating the power of Indian leaders to challenge colonialism, to recover from its depredations with honour and with history intact, with the nation facing forward towards the future. The murals that hang in the ‘temple of Indian democracy’ reflect an essentially elitist history – the subaltern is absent from the narrative structure, even though their bodies inhabit some of the paintings of the later freedom struggles. No one could be in doubt that these murals try and retrieve Indian cultural moments as well as national ambitions. These murals also invoke the particularity of Indian secularism – a tolerant, multicultural interpretation rather than a rejection of religion by the state – even as they embrace mythology as history. India’s glorious past is reflected in these panels, as is its bright future. This was not the top-down carefully constructed elite narrative that is found in the Indian Parliamentary murals. It was the women of Hamburg’s mediation on the work of professional historians and the colonial archive. As such it is a disruption of elite narratives of South African history even whilst it cannot escape the hierarchies of knowledge that have placed the women of the Keiskamma in the position that they must learn this history from such an archive. The Keiskamma Tapestry’s narration of the nation was ‘process-based’ and as such the historical events it would depict were not pre-planned. The narrative is, as a result, largely focused on a beginning and an end. Panels 1-12 focus on pre-colonial history. Panels 13-64 cover the encounter between colonists and isiXhosa speakers including the Frontier Wars of 1779-1878. The tapestry then jumps forward to the apartheid-era from 1948 depicting this time in panels 65-68. The final panels, 69-73, show the First Democratic Election in 1994 and as such ‘the restoration of rights that had been eroded through colonialism and apartheid’. Whilst this un-planned narrative apparently had no proscribed list of historical events it seems clear that it was felt necessary to ‘end’ it with the first democratic election. In the tapestry there is a telescoping of South African history into a moment of defeat and then redemption. This is emphasised by the hanging of the work in Parliament. Panel 57 which depicts the prophesy of Nongqawuse and the ‘Cattle Killings’ of 1856-7, an episode which heralded the end of amaXhosa resistance to colonialism hangs directly above Panel 72 showing the First Democratic Election. According to the Arts Curator who was in charge of hanging the piece this juxtaposition of defeat and triumph was ‘pure luck’. 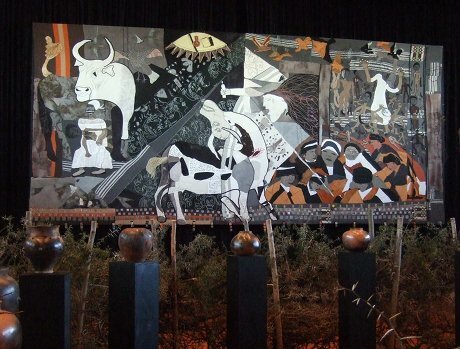 Unlike the Indian Parliamentary murals the Keiskamma Tapestry does depict the trauma of colonisation, and includes figures of colonials and even Queen Victoria and the ‘architect of apartheid’ himself Hendrik Verwoerd, the latter appearing in a tableau of the 1961 Rand Show, the site of the first assassination attempt against him. (In another potent echo the depiction of this first assassination attempt hangs on the outside wall of the chamber in which, in a second attempt on his life, Verwoerd was actually killed). In the Tapestry there is a willingness to acknowledge trauma and defeat, perhaps enabled or even encouraged by the post-apartheid Truth and Reconciliation Commission and the histories of trauma this has inculcated. In its Parliamentary location the Keiskamma Tapestry hangs along the corridors surrounding the Old Assembly Chamber. It wraps around the chamber used during the apartheid-era which is now used as a committee meeting room, and every Wednesday afternoon hosts the ANC caucus meetings. Hanging the Tapestry here addresses what was perhaps the most problematic part of the parliamentary buildings: the chamber in which apartheid laws were made with its dark wood panelling and dark green seating modelled on the British House of Commons, is one of the most symbolically potent rooms in the parliamentary precinct. In this location the Keiskamma Tapestry offers a rejoinder to this space and what was authored and authorised in it. It seems that ‘wrapping’ has proved a typically post-apartheid means of addressing the monuments of apartheid South Africa’s symbolic landscape. For example, on September 23, 1999 as part of the Cape Town One City festival, the prominent statue of Louis Botha that stands directly outside Parliament was wrapped in new clothes and transformed into the figure of an abakhwetu or Xhosa initiate arriving home from the circumcision rites that would induct him into manhood. In another instance the statues that stand outside the Union Buildings in Pretoria were wrapped in black cloth prior to Thabo Mbeki’s inauguration ceremony ostensibly to ‘protect’ them. Whilst in this last case Mbeki was accused of a desire to ‘cover-up’ or erase the past, in fact these wrappings do not do so; they are always in a dialogue with the structure on which they hang. These wrappings whether they absent the monuments, transform their meaning or ‘talk-back’ all derive their potency from their conjuncture with the old symbolic landscape. The Indian Parliamentary Murals and the Keiskamma Tapestry are very similar as aesthetic political gestures: they both incorporate former sites of colonial and apartheid power into a post-colonial nation through decorating old buildings with ‘indigenous style’ art. Yet compared alongside one another it is clear that different dynamics of ownership, artistic articulation, and historical narratives are at play. Whilst the Indian parliamentary murals were commissioned in a tightly controlled political elite driven process, the Keiskamma Tapestry emerged out of a women’s self-help development project, and was then borrowed by Parliament from a private bank that owns the work. The Indian murals were created by professional, and anonymous artists whereas the Keiskamma Tapestry was made by a group of women in collaboration with professional artists. The names of all the women involved are sewn into the border of the tapestry; their labour (artistic and historical) in producing the Tapestry is an intrinstic part of its meaning. Whilst the Indian murals are celebratory, the Keiskamma Tapestry juxtaposes traumatic defeat with eventual freedom. The contingent strategies of legitimation used by post-colonial elites in India and South Africa in their similarities and differences reveal the shifting nature of the ‘post-colonial’ aesthetic from the 1950s to the late 1990s. Marc Howard Ross, ed., “Strategies for Transforming and Enlarging South Africa’s Post-Apartheid Symbolic Landscape,” in Culture and Belonging in Divided Societies: Contestation and Symbolic Landscapes (Philadelphia, Pa: University of Pennsylvania Press, 2009), 199. Brenda Schmahmann, “After Bayeux: The Keiskamma Tapestry and the Making of South African History,” Textile: The Journal of Cloth and Culture 9, no. 2 (2011): 158–193. Art Against Apartheid, programme from official opening of the exhibition by Artists of the World Against Apartheid, South African Parliament February 8 1996. Public Education Department, Republic of South Africa. South African National Library.